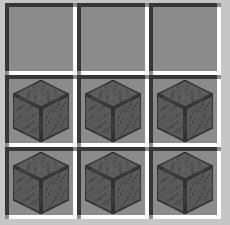 Black Stained Glass Pane is an block that can only be made. It is just like the Black Stained Glass but is thin like the Glass Pane. It does however require a lot more material to make because it is crafted from the stained glass. Its main purpose is to be used for decoration. Stained Glass does not fall if the block below it is removed allowing it to hang off buildings. Any light that goes through the Black Stained Glass Pane will not be effected by the block. If the Black Stained Glass Pane is hit, the item will be destroyed not dropping any material.